Two weeks on the bike, not a day off. 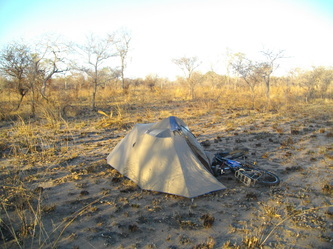 Thirteen of those nights were spent camping: sometimes in villages, sometimes outside police stations, sometimes alone in the bush with baboons screeching nearby and flying squirrels gliding overhead. This entry is a rough play by play of the past 14 days. After five days of relaxing in my Brazilian friend Jacques’ beautifully simple beachside bungalow, learning juggling and macrome and how to cook matapa, I said goodbye to him and the plethora of Couchsurfers and others who were constantly rotating through his friendly doors. It had been a comparatively luxurious week of good food, good wine, and always someone strumming a guitar nearby to ensure a good start to each evening. 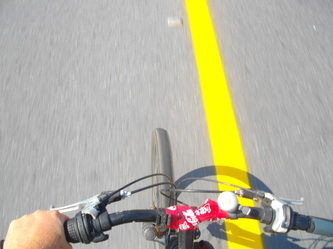 But the road north called, and every day of rest brought forth a stronger desire to get back on the bicycle. I left mid morning on a Sunday with a reasonable 100 km per day general plan to get to Nampula - capital of the Mozambiquan north - within a couple of weeks. 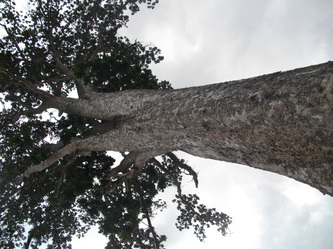 The road veered away from the coast, so on this stretch there wouldn’t be any tantalizing Indian Ocean beaches or the wild barefoot parties that the white sand seems to demand – I was sure that without distractions I would make good time. 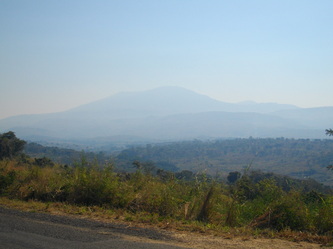 Everything went smooth the first few days - both figuratively (no problems) and literally (flat, freshly paved roads). 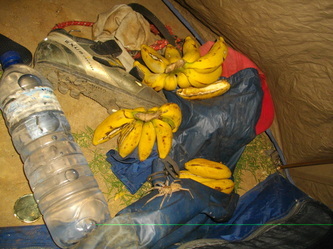 Night one was passed at a police station where I got a bucket shower and was close enough to a market for a decent meal. 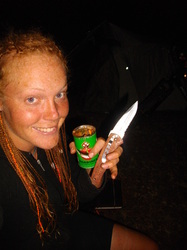 Night two was in a tiny, five-hut village, where the curious chief lent an awkward hand in putting together my tent, and then surprised me by setting up a small secluded table away from the rest of the villagers where I was served a tasty dinner of shima and chicken soup. No matter how often it happens, it always feels odd eating in a separate, "honourable" place; I would much prefer squatting around the fire with the rest of the group, laughing at one another as we attempt sign language - this is how things often were when I was hitchhiking. 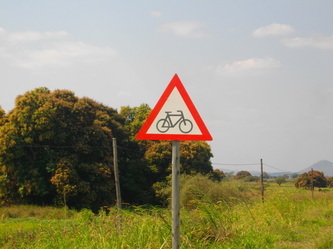 It could be that in this part of Africa the traditions are different than in West and Central, where I am used to, but I suspect it is much more to do with my mentality and approach as a cyclist. Hitchhiking and walking I would show up in a village with nothing better to do, and nowhere better to go, than sit with the people which inevitably led to breaking the ice by playing games with the kids or trying to tell gesture-stories. 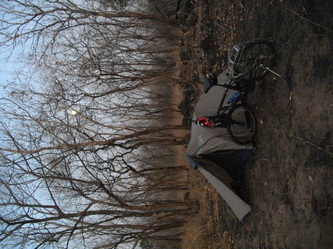 With cycling I get to a village late, am usually tired, have to set up camp, stretch muscles and possibly do bike maintenance, bathe, and by the time that's done its pitch black out, dinner is ready, and then the angel of sleep beckons with that overwhelmingly irresistible urge to crawl into a cozy tent and rest sore muscles. The mornings it is pack up and go at first light. So there is little time to break the ice or get to know individuals, save maybe the chief. In this sense, cycling solo is lonelier than hitchhiking, not only because the days are long and lack meaningful interaction, but neither do the evenings or mornings offer much time to get to know the people I pass. Don’t get me wrong, there are amazing aspects to the cycling experience, but I have found this means of transport to be more of a personal challenge than one that leaves me feeling connected to the people I meet. 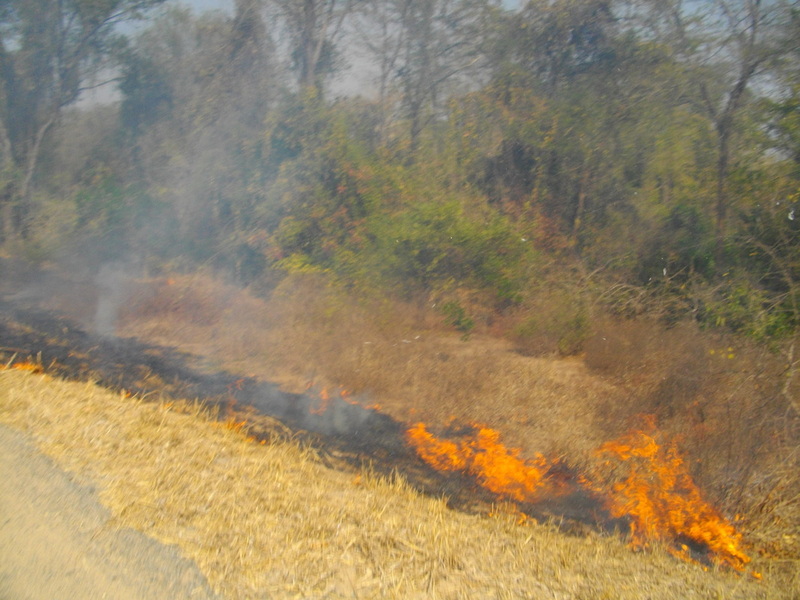 Day three it was becoming clear that the crowds of the south were getting sparser - more bush, less people - and that night was spent wild camping a few hundred meters from the highway, in a patch of woodland recently cleared by a forest fire likely started by villages to clear land for crops. 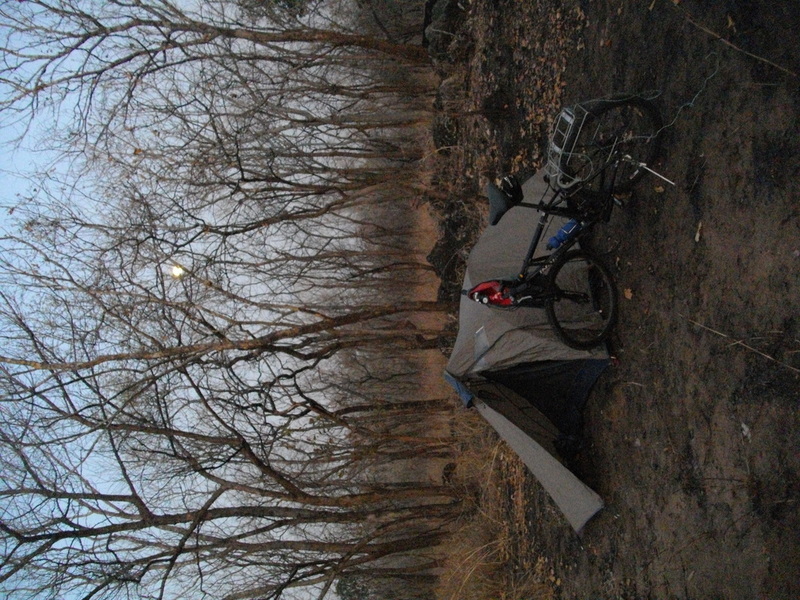 I had seen a few troops of ten or so baboons during the day, but was happy not to encounter them once camp was set up. That night was the first of many where the dinner options were limited to paper-like canned sardines, metallic flavored tomato paste, and stale crackers - maybe that's why the baboons stayed away. Packed up camp on day four and it was 25 km before finding a tiny hut-shop to get something edible - cookies or the ubiquitous 50 ml bagged gin were the options - and another 30km before a decent sized village in which to proclaim a satisfactory breakfast of bread and bananas. However after that, food-luck came my way again and cycling past a picnicking South African family I was invited for a hearty lunch. 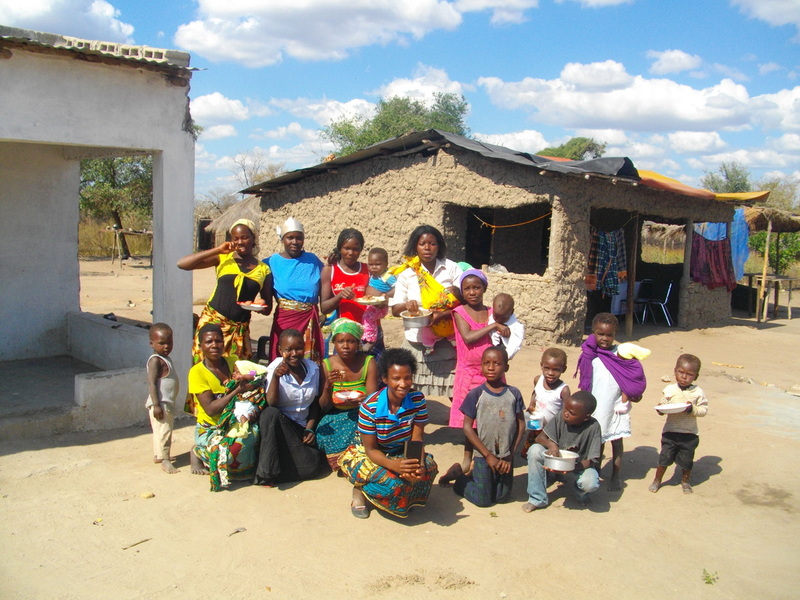 The family was part of a church group that preaches around Southern Africa. I was impressed by their genuine generosity, inviting to the meal of sandwiches and juice not only myself but also the few locals who happened to walk by; when the villagers didn't come over for fear or language barrier, one of the group packed some leftovers in a bag and ran it over to the surprised Mozambican. My take-away was a few ziplocks filled with that delicious South African snack - rusks - along with a few chocolate brownies. Set for the day! 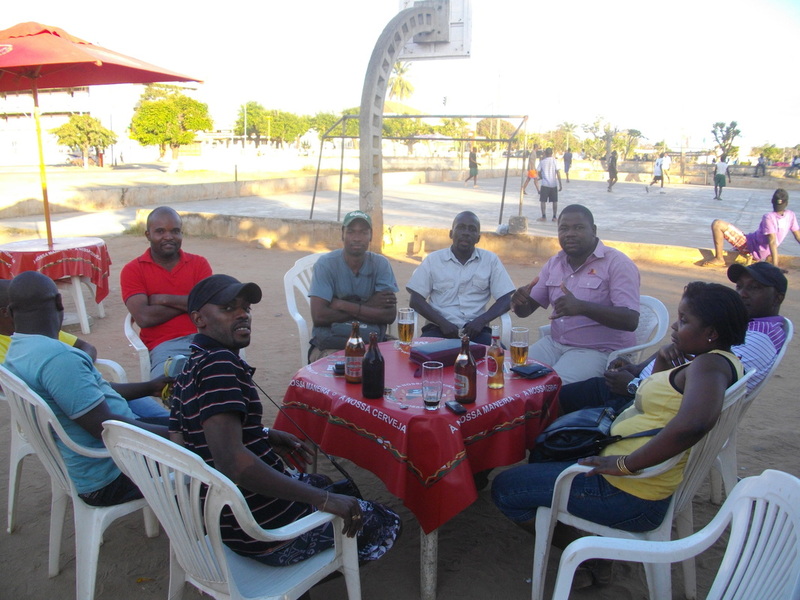 After that lovely lunch, kept peddling, and the luck of the day held strong - just as the brilliant crimson sun dipped below the horizon I gleefully pulled in to Inshope, the busy trucker town that marks the half way point of Mozambique. 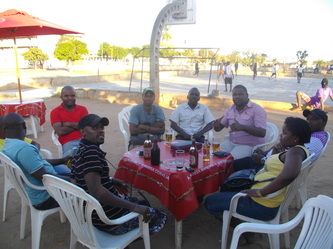 The police let me camp outside their station, and we shared a few beers at one of the many tiny bars, each with more speakers than seats blasting heavy marrabenta, timbila and rumba. All seemed well and I enjoyed a night of high spirits - I was on track distance-wise, meeting great people, feeling healthy, and without bike trouble. Unfortunately the optimism was premature: due to fatigue and the shadows of twilight I had not noticed the mountains looming along my northern road. The fifth day started off well. Upon noticing the mountains I was full of nonchalant determination, and stocking up with a few supplies took off early to take them on. I had definitely improved on uphills since the Swaziland days of having to get off and push; nevertheless hills fatigue exponentially faster than flat land and have a tendency to amplify stressed joints such as knees and wrists. Luckily the Tour d'Afrique cyclists from back in Botswana had shared the wisdom that got them through days averaging 140 km with only one rest per week for months on end: "drugs". Consequently I had stocked up sufficiently on anti-inflammatories and they were helping my sore knees fight the uphill battle. The mud-brick village church I camped next to that night was only a frustrating 70km passed Inshope, but progress is progress. The pastor and his family were kind, and I was again served an isolated, honourable meal in a corner. 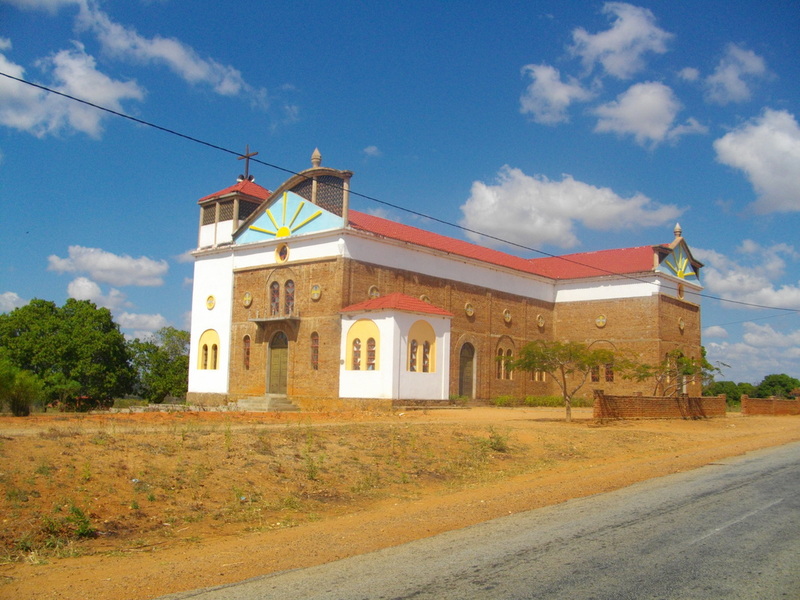 I was also reminded of the danger of camping next to an African church: there is a high risk of losing sleep to religious zeal. Sure enough, at 3:30 a.m. the enthusiastic singing-prayers started a few meters from my tent and lasted until sunrise. At a quarter to six upon finally emerging from feigned sleep, I was greeted by half the congregation who had organized some benches from the church in a semi circle around my camping spot, waiting to greet their visitor. It was all in good intention of course, and after a few laughs we waved goodbyes as I rode off, climbing another hill. Unfortunately it's not only the body that experiences harder wear from hill climbing, and it wasn't long before my discount Chinese bicycle started having issues. Basic repairs aren't a problem, but neither myself nor the village mechanics could come up with a permanent solution to the alignment of the back tire, which kept moving and rubbing against the rims. An hour or so after they "fixed" it, the same thing would happen again. So besides slow progress due to hills, there were also multiple stops at village repair shops where each mechanic concluded in broken Portuguese a different explanation and solution. Frustration was growing, and so was fatigue. That night was another bush camp, and day seven started off with a flat tire and more alignment problems, not to mention the diet was back to stale cookies and paper sardines. The previous night I had finished reading Jules Verne's Around the World in 80 Days, and although Philius Fogg's example of unshakable calm and perseverance was in mind, I simply don't have the composure of the upper-class Victorian-era British. 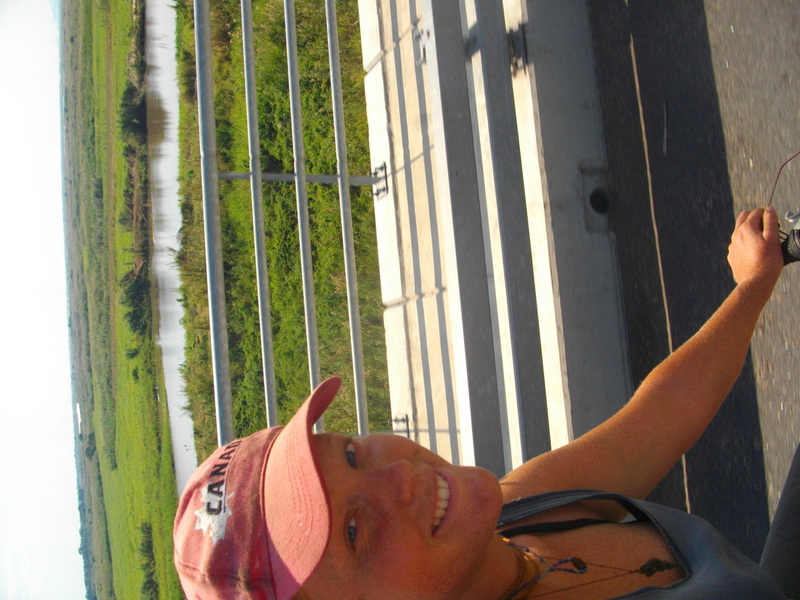 I was tired, annoyed at the bicycle problems, and started contemplating surrendering to the temptation to hitch a ride. What I needed was a proper mechanic, a bath, and a cold drink, but it was still 250km to the next town. Of course, the travel gods came through as usual. Stopping at a remote timber camp for water turned into an introduction to the camp boss, lunch, then dinner, and finally scotch on the rocks - probably the only 'rocks' within a 200km radius. I got my hot bucket bath and privacy for the night within walls thicker than nylon. At times like these it’s not so much the physical comforts that revitalize, but the mental ones: the reminders that things work out and the reality check that it wasn't so bad anyway. Plus, it seemed they had fixed my bike. Next morning, fresh and smiling I took off over land that had flattened out considerably, and didn’t even let the strong headwind get me down. 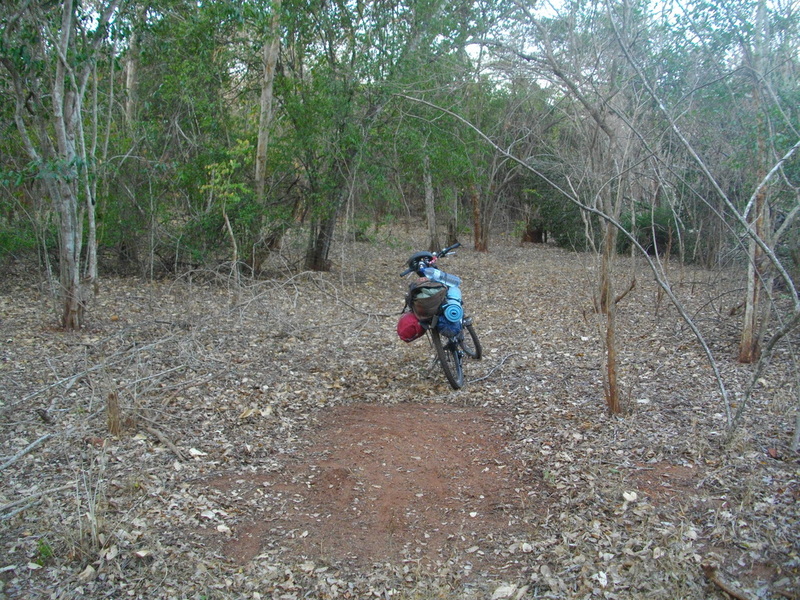 I was riding mostly through bush land with the occasional tiny village, but was surprised to see a small clearing for a farm where horses were kept – horses are a rarity here and don’t do well in Mozambique’s tropical climate, but some have been brought over from Zimbabwe and South Africa where the European settlers were able to keep them healthy in the colder climates of those countries. 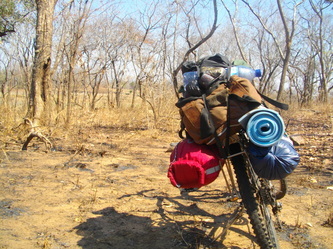 Stopped to chat a little broken Portugese with the owners, and then road until nightfall where a comfortable clearing in the thick bush presented itself – perfect for a tent. 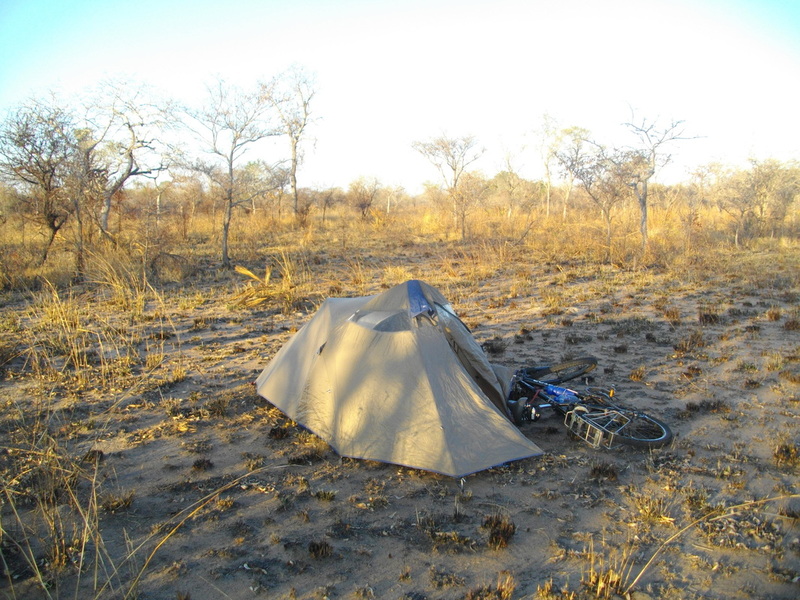 As I set up I saw a few waterbuck foraging 40m from my tent, but they were harmless. More intimidating were the baboons that woke me in the middle of the night, grunting to each other, seemingly running circles around my camping spot with an exponentially decreasing radius. Baboons are quite intelligent and very conniving – in Nigeria I once witnessed one scope out a car load of people as they parked their car, rolled up their windows and got out. Within fifteen seconds of them walking off down a path the baboon had run over, stuck his fingers in the one window that had been left open a crack, and swung himself against it violently until the window shattered. He had helped himself to the bag of food in the car and jumped out of reach all before the bewildered visitors could run back over and shoo the baboon away. That and several other incidents had me wary of baboons, and not interested in having them as camping mates. Luckily after a bit of a screeching match between myself and them, woman versus wild, they took off. I slept peacefully the rest of the night. The next few days were rather uneventful. Made it to Caia and crossed the great Zambeze River for the last time (on this trip), and continued north past tiny farming villages benefitting from the fertile crocodile infested lands, all the way to Nicuadala, which somehow ended up in a night of partying with the ever-present Laurentina Preta. 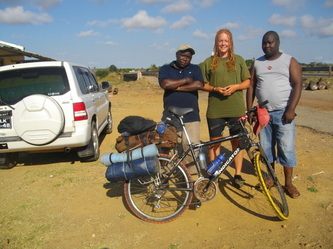 My plan for the following day had been to cycle to the next town and stash my bicycle in order to hitch to Malawi for a week, but Mocuba, where I’d planned the stash, turned out to be much larger than it had looked on the map and far too steeped in bureaucracy to find a sympathetic official to watch my bike. So after a night at an uncomfortable police station trying to explain what I was doing, I took off again, and once again fell out of luck with the road. 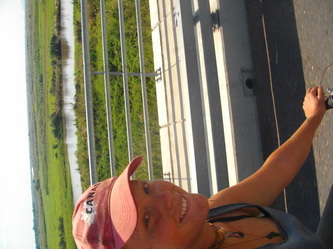 It turned out that the way north was under construction, and the next 70km or so was all dirt, mud and hills. I initially thought I would enjoy the change of terrain, but it wasn’t 10min in that the excessive bumpiness caused the shady bike repairs began to fail. I was blissfully heading full speed down a hill when screws went flying and my panniers came loose, and everything attached to the back rack shook precariously. I had spare parts but turned out they didn’t help much. What followed was a full day of riding extremely slowly, walking, and stopping at village mechanics to see if they could improvise a fix. 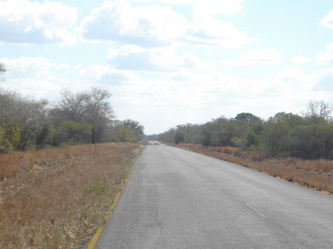 Needless to say, I was pretty happy when around nightfall the construction signs ended and freshly paved tar roads lay ahead, with a promise that they would be this way all the way to Nampula, a city big enough to guarantee a bike fix, and relaxation. After one last night of police-station camping and getting bombarded by a reporter waiting outside my tent in the morning, I have made it here to Nampula. I am staying with a wonderful group of people that randomly called me over to share a beer as I was arriving in the town centre, and they have even agreed to watch my bike as I take a quick jaunt over to Malawi - the plan is to spend a few days floating on the crystal clear waters of the famous lake and then challenge the visa bureaucracy of Lilongwe. 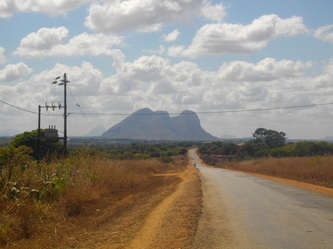 It will be a nice vacation from Mozambique – I’ve already peddled over 2100km in this long thin country, only 850km until Tanzania!